The OEGenericFF2 class facilitates creation of a user defined force field of type OEMolFunc2. The force field instance can be extended by adding internally or externally defined potential functions. This method defines the interface for adding externally declared functions to an OEGenericFF2 derived instance. The second argument denotes whether the OEGenericFF2 derived instance is to take ownership of the memory occupied by the external function. If ownership is passed, then it would be deleted during destruction of the OEGenericFF2 derived class. Any object derived from the OEMolFunc2 may be added using this method. The method returns true if the object of OEMolFunc2 is successfully added. Only one copy of a OEMolFunc2 may be added to an OEGenericFF2 instance. Subsequent attempts to add the same function object to already contained in a OEGenericFF2 derived class will fail with a return value of false. 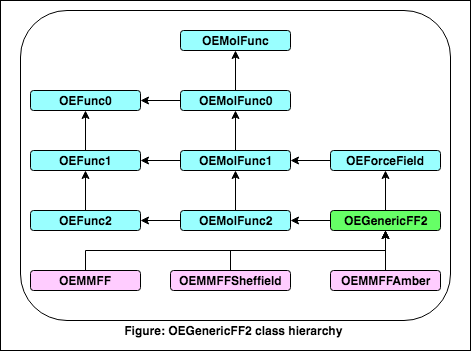 Method returns a vector of pointers to the currently contained OEMolFunc2 instances on this OEGenericFF2. Defines an interface to remove a function previously added to an OEGenericFF2 instance. If the function is not contained in the OEGenericFF2 instance then the method will return false. If the function is found and removed successfully, then the method will return true.